Regulatory Affairs requires an IT set-up that copes with the increasing complexity and makes it easier to manage. Through the transformation to a unified platform, you break down your silos, standardize your data and optimize your business. ​​​​​​​What is Regulatory Affairs Transformation? During the past decade, Regulatory Affairs has undergone significant changes. Technology has evolved, yet with increasing requirements from authorities the challenge is to maintain legacy systems which today are complex and costly. Many RA departments have a desire to transform their business through new technology, and to reap the benefits of innovation and IT optimization. The challenge is how this is governed and to define the roadmap for this transformation. Most RA departments operate individual, using fragmented and not integrated IT applications, such as Electronic Document Management System (EDMS), Electronic Common Technical Document (eCTD), Regulatory Information Management System (RIMS) and labeling systems to embrace the many varied tasks involved in RA. While these IT solutions for the different RA processes may be robust, they exist independently, resulting in the creation of many closed-off and expensive “silos” of data. These silos are counter-productive to what really matters: Getting new products to the market. With a unified platform it is possible to transform Regulatory Affairs processes by merging these systems into one platform, standardize data models and use cases and thus improving both compliance and operational efficiency. What are the benefits of digital transformation in RA? Having many silos inhibit the access to data and ultimately results in unrealized potentials for market development. RA transformation challenge this paradigm. From documents to data. EMA and FDA are increasingly requesting submission of structured data in addition to documents. RA transformation will bring documents and data together so that the information in the submissions is aligned and transparent, regardless of the format and across the application landscape. Agile data sharing with other business areas. RA and the other critical areas within the value chain such as Clinical, Manufacturing and Pharmacovigilance can more easily exchange and re-use data to support business processes and the regulators’ enquiries. Easier external collaboration. Collaborating with various external stakeholders such as service providers, consultancies, regulators and partners will become easier and more time efficient in a unified platform. RA Analytics. With separate systems and scattered data, it is difficult to monitor regulatory operational activities. By contrast, RA transformation will allow for better analytics with the purpose of identifying challenges and bottlenecks in the RA processes. By changing to a unified platform, the entire process landscape supported by today’s EDMS, RIMS, eCTD and Labeling systems can be covered by the platform. It will take time to break down the silos and transition from the current systems, but the benefits of transforming RA are both operational and strategic and will prepare you for the future challenges in RA. It is no secret that the actual migration of data from your legacy systems to a unified cloud-based platform is a massive and critical task. For companies in highly regulated industries, data quality and precise migrations are paramount. As this data contains information within IP, regulatory, compliancy, safety and quality, it must be migrated in an accurate, compliant and timely fashion. Therefore, we utilize the most proven GxP migration software and methodologies. 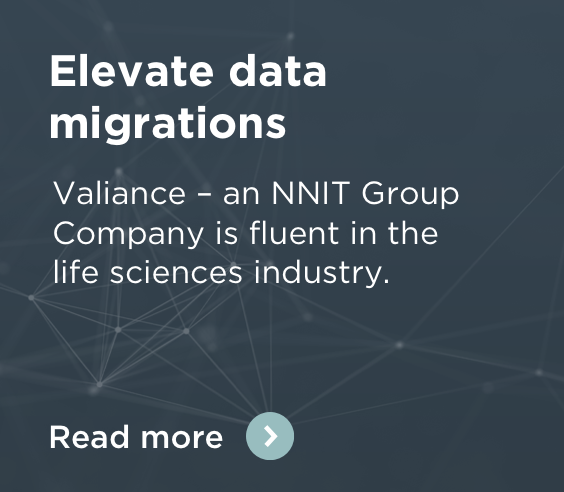 We do so through Valiance Partners – an NNIT Group Company, and the automated TRUseries. Valiance has operated more than 500 migrations for 100+ customers globally and offer fluency within the relevant business processes and the regulations that govern your industry. NNIT has more than 20 years of experience in RA systems, and NNIT possesses expert knowledge in the field of RA transformation. NNIT understands how an RA department works in order to make this transformation a success with the RA stakeholders. NNIT will make the transition to a unified platform possible through consulting, mapping, data migration, implementation and execution. NNIT will also guide you through the entire process and help you activate your regulatory data to support the submission processes. Strategy. We help to create a clear vision with a Road Map for the whole process. Program. We help you to identify stakeholders, select projects, and design your business case. Once the overall master plan is in place, the process begins with EDMS, RIMS, publishing or labeling. Ultimately, this will give your company the right platform and governance for managing all RA information.